Assisting Business Harmony Amongst the Generations The Canberra Times featured HRMWEB in its Sunday edition with an article about family business and Gen Y - specifically how to enable successful succession planning when dealing with the next generation, who will soon be handed the reins of the family business. HRMWEB puts an interesting spin on this as it's a family business who has Gen Ys AS the first generation business owners. So the management team are (for now) less concerned about succession planning and more focused on helping other business to harness the skills of the Gen Y workforce - who are often considered a thorn in the side of Baby Boomer and Gen X business managers/owners. 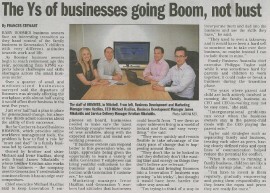 Read on to see the full Canberra Times article and how HRMWEB is building better relationships between all the generations involved in a business! In November's “Guest Writer Series”, Guy Pearson from Interactive Accounting, talks "Systems v Labour" and how to make technology work hard for you - so you don't have to!